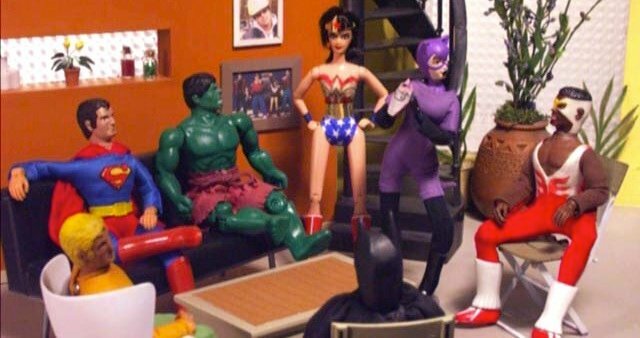 More Details About Robot Chicken‘s DC Comics Special, Including Cast Members! Back in October, at New York Comic Con, the creators of Adult Swim‘s Robot Chicken announced that they’d be doing a special centered solely on the DC universe. But at that point, there wasn’t much for them to show us, aside from all the sketches they’d already done with DC characters. Now, however, is a different story, because they have announced a cast of pretty amazing people to provide voice talent. We also know it will be coming this fall, probably just in time to promote at the next NYCC. Seriously, even this Marvel girl is psyched for this. So, true, the fact that this is coming is not breaking news, but it’s always pretty great to hear new details about upcoming projects — especially if Nathan Fillion is involved. What? Nathan Fillion is involved? Yes, Nathan Fillion is involved! [T]he voice cast includes Robot co-creator Seth Green as Batman, Robin and Aquaman; Paul Reubens as The Riddler; Neil Patrick Harris as Two-Face; Alfred Molina as Lex Luthor; Nathan Fillion as the Green Lantern; Megan Fox as Lois Lane; and Breckin Meyer as Superman. This will be the first project to come out of the newly-formed Stoopid Buddy Studios, which will be followed by Robot Chicken‘s sixth season. The creation of the new stop-motion animation studio officially cut Green & Co. loose from ShadowMachine Films, which was serving as producer of Robot Chicken, and partnered them up with John Harvatine IV and Eric Towner at Buddy Systems. Stoopid Buddy Studios will not only produce projects by the Stoopid Monkey crew, but outside projects as well. No exact release date was mentioned for the DC special, but as I said, it could come in time for a sweet preview at this year’s NYCC.